Our fifth week anniversary found us leaving Newport and heading south along Oregon's coast . . . again! First stop was at Seal Rock Beach. 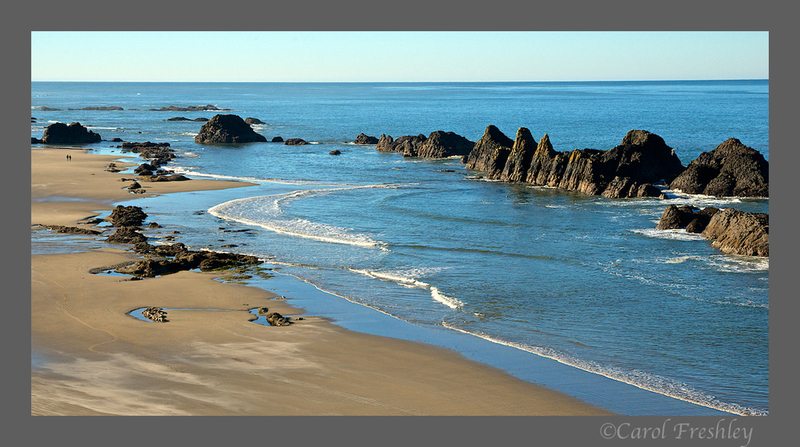 No seals, but plenty of photo opportunities. Two people walking along beach give you an idea of the rocks' size. 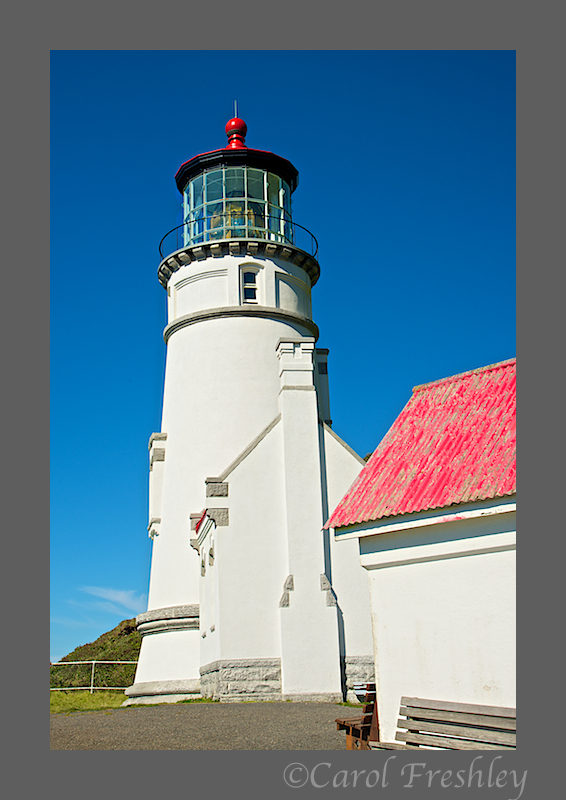 We then headed south to Heceta Head Lighthouse, one of Oregon's 9 coastal lighthouses. This lighthouse has a 56 foot tower that sits 205 feet above the ocean. Built in 1894, its now automated electrical beacon can be seen 21 miles offshore (its light only limited by the curvature of the earth)! You can tour the lighthouse for free under the careful supervision of volunteers who take up very small groups at one time. 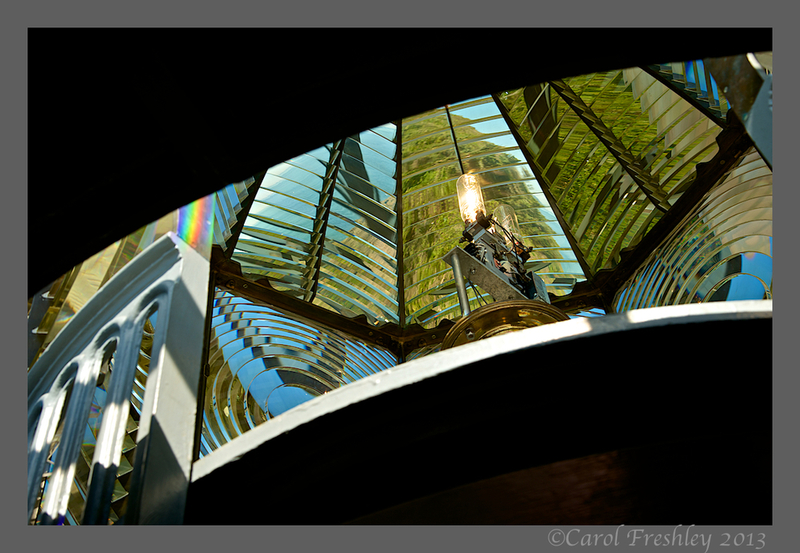 The lighthouse underwent major repair and renovation in 2011 and 2012 and just re-opend in the spring of this year. Photography inside is allowed. Space is really cramped and since we were part of a group we were moved along. Setting up a tripod was almost impossible. The lighthouse is still a working part of Oregon's sea navigation. When we got to the top we could see up into the rotating light. Its 1,000 watt quartz bulb is amplified by a 392 prism Fresnel lens. 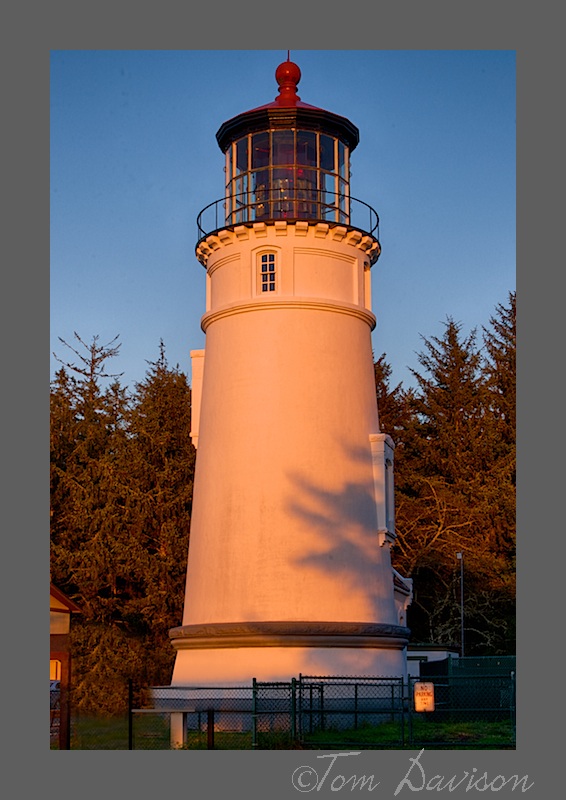 Each lighthouse has its own signature and in Heceta's case this is a 10 second cyle of light. The following image is the best I could do in a very small space, looking up and waiting for the opening to rotate around. After our tour Tom headed up the hill behind the lighthouse. He came back with a different perspective. The original lighthouse keeper's house has been torn down but the assistant's duplex remains and can now be reserved as a bed and breakfast. A woman whose family comes every year to stay there was telling a group that the 7 course breakfast buffet was just to die for. The B&B operation is contracted out by the Forest Service and the volunteers thought it would run about $200 a night. Not bad! 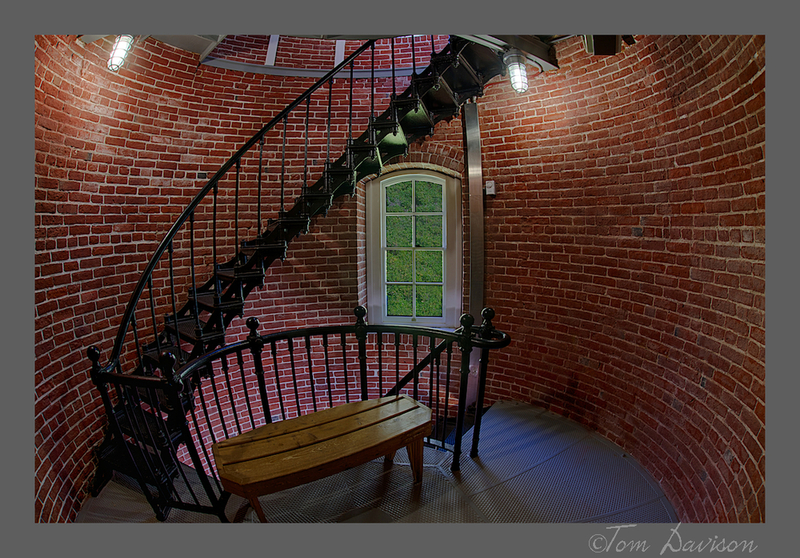 We then went to the Umpqua River Lighthouse. What a difference. It is part of housing for Coast Guard families and the Department of Homeland Security has it behind a double fence with warning signs everywhere. Difficult to photograph, to say the least. 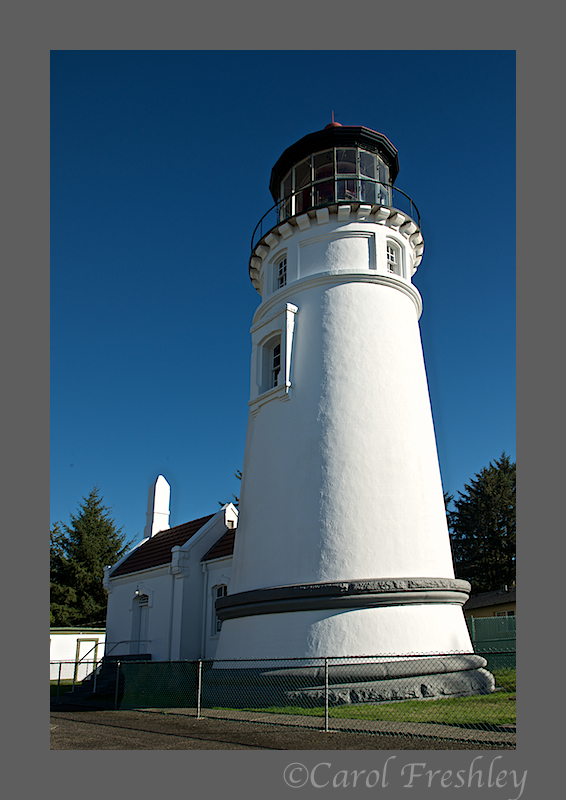 This lighthouse is very similar to Heceta Head Lighthouse and both were built in 1894. This one overlooks sand dunes that run about 50 miles along the coast from Newport to Coos Bay. It has its own distinctive signature consisting of alternating white and red light beams. We did not go inside this one but tours can be arranged. To eliminate the signs, I hung my camera right over the edge of the first fence and sign. The disadvantage is that there is more distortion of the building. A young woman stopped and told us to stay until after sunset as the lighthouse made for some real good photography then. She was the lighthouse 'keeper' so we took her word for it. Sure enough, photographers started showing up at sunset. The draw here is not only the light, but that as it rotates it puts these eerie light patterns moving across the nearby trees and you can see the light beams. I tried for a long time to capture that phenomena but we would have had to wait until it was much darker to see them clearly. We were tired and 20 miles from Coos Bay so we did not stay. The lighthouse looks nice in golden light. Sunset wasn't bad. We are in Coos Bay for the day. I am sure we will find something to shoot!!! Wishing each and everyone of you a great day.